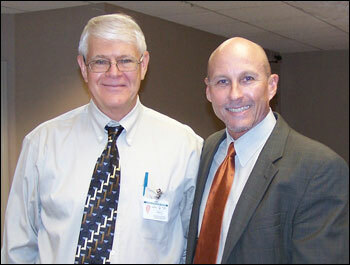 Paul Rice, pictured here with Circuit Court Judge S. James Foxman, chaired the Volusia County Bar Association's Family Law Section meeting at the Courthouse Annex on August 31, 2010. Atlhough the purpose of the meeting was to address recent legislative changes to the laws governing alimony and child support, the judges, clerks and family law attorneys in attendance took time to recognize and thank Judge Foxman, who is retiring at the end of this year after 31 years of distinguished service on the bench. Judge Foxman is very proud of the fact that he is being replaced by his son, Matthew Foxman, who was recently elected to fill the soon to be vacated position. Mr. Rice updated the group on the recent changes to Florida Statute Section 61.08 dealing with alimony. Effective July 1, 2010, the Florida legislature codified bridge-the-gap alimony, established a new type of alimony named "durational alimony" and defined short term, moderate term and long term mariages and the different types of alimony available for each. Dawn Nichols, Esquire, discussed the amendments to Florida Statute Section 61.30 dealing with the child support guidelines. The most notable change is that effective January 1, 2011, parents with the children more than 20% of the overnights during the year will be eligible for the substantial shared parenting calculation of child support. This amendment was designed to reduce litigation between parents over the number of overnights each has with the children. The VCBA Family Law Section meets periodically to discuss changes in the law and issues facing family law attorneys. It also provides a venue for practitioners, judges and court administrators to openly discuss and address the challenges and problems encountered in this ever-changing family law landscape. Court budgets have been slashed to the bone. Parents have lost their jobs and are faced with the prospect of losing their homes. Many litigants can't afford attorneys and are "going it alone" to file for divorce, custody, support and/or injunctions for protection. Reduced judicial resources and an influx of court filings due to this prolonged recession have combined to create clogged courthouse dockets, delayed justice, frustrated litigants and frazzled judges. We family law lawyers in Volusia County tip our hats to the judges, clerks and other courthouse staff who are having to do more, actually much more, with far less. Everyone keeps saying it can't get any worse...and then it does. Its got to get better.